Raise your hand if you wish you could wake up tomorrow and have already conquered those dreams you have. Maybe you’re hoping to make 2017 your year of health. Or maybe you’re in the process of pursuing a career in the field that lights you up. Here at alisanelson.co I talk a lot about the value of self-awareness – but a mega-downside of being aware of where you are and where you want to go is the discomfort you experience when it takes a long time to reach the other side. That saying “ignorance is bliss” is not a joke. No matter where you are on your journey the gap always feels too big, right? Publishing video on my website has been on my mind for a long time and what better time than when I get to talk about being on the path toward growth. The mind finds ways around trying new things because that involves uncertainty. Even as I’ve prepared to publish this post it’s been a test of how much do I really believe the stuff I say – am I actually willing to put something up that isn’t polished yet? Am I willing to come out from behind my writing and show that there’s a real person here trying to grow skills alongside everyone else? So I’ve followed the five steps I’m sharing in today’s video. If you want to step into 2017 with greater confidence in your capability to follow through and see success, then this video is for you. Remember how I said it’s important at the start of any journey to remember that you are an organism? A machine can go from scraps to completion in a matter of days. Hours, even. If you want to truly become something different than you are now – not a simple filter or outward image to portray but bone-marrow-deep real change, then you must master staying with something even when it feels uncomfortable. Even when it means showing someone your unpolished, just-starting-out self. Today’s video is just under 8 minutes and even includes an unpolished “don’t hit mommy” moment. Because real human life, ya’ll. And to help you start putting it into your own context, I made an action book for you. And it’s even editable so you can get started right away if you’re about ready to jump ship on your dreams for change. No email required, just click the button and start writing. Consistent movement toward a goal requires little steps along the way that prime your brain to focus in on the target. Rewards feel good and by racking up small wins you can teach your brain that growth actually feels good. Making it less of an obstacle and more of a lifestyle. With each of the 5 steps I mention in the video you are putting your energy where it matters most – getting your brain on board with living life a new way. 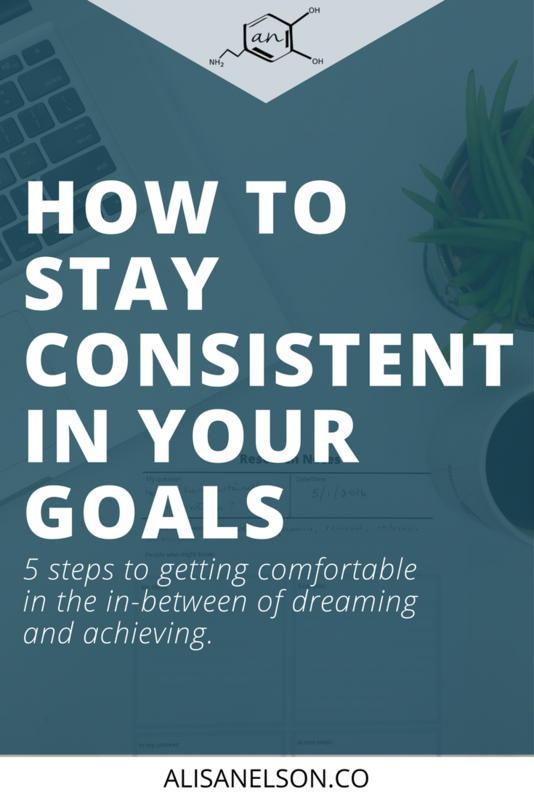 By answering your built-in need for human connection, predictability, and long-term benefit you set yourself up for success during that in-between time that feels so uncomfortable. Now you’re free to fully engage in the process of living your life and growing because you have taken the steps to normalize it. It’s not about a big sudden change, it’s about making growth a normal part of life. In the comments below I want you to tell me which step is the most difficult for you right now. I’d love to help you start to bust through those blocks so you can keep on the path to growth. If you’d rather talk privately, send me an email (alisa@alisanelson.co). I’d love to talk over email or jump on a Skype call and talk face-to-face. Seriously. No sales pitch, just two humans strategizing on how you can take a step forward.